I'm happy to announce that our April seminar was featured in a magazine in Japan today! Read the full article on their website here. I had a great time holding a discussion with Japan's well-known dietitian, Mr Hideo Makuuchi, about Australia's "obesity epidemic". When someone (even a doctor) tells you to "lose weight to improve your health" it just doesn't make sense. Weight-loss seeking diets will deprive you both physically and psychologically as you restrict food intake, variety and pleasure. You may also engage in obsessive exercise regime in order to "burn" the calories consumed. There will come a time where you can't handle it anymore and "give in" to the "bad" foods. You will feel defeated, worthless, and useless as you "don't have enough will power to sustain a weight loss diet". Since you've broken the diet rule, you may think "I might as well eat badly for the rest of the day/week and start all over again after". 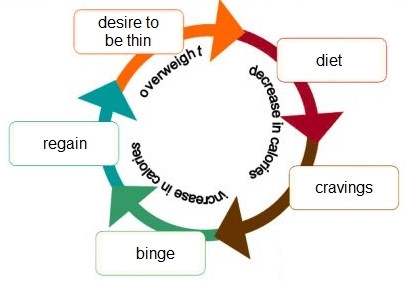 The Diet Cycle leads to weight cycling (commonly known as yo-yo-ing) which is known to have negative impact on physical and psychological health. We don't need more weight shaming. What we need is weight inclusivity and size acceptance. Health can be achieved at various shapes and sizes; not just at a BMI of 18-25. Next time you think of health, maybe you can really think about HEALTH instead of weight attached to the side. Miller WC. The weight-loss-at-any-cost environment: how to thrive with a health-centered focus. J Nutr Educ Behav. 2005 Nov-Dec;37 Suppl 2:S89-94. Review. Bacon L, Aphramor L. Weight science: evaluating the evidence for a paradigm shift. Nutr J. 2011 Jan 24;10:9. doi: 10.1186/1475-2891-10-9. Review. Erratum in: Nutr J. 2011;10:69. Bacon L, Stern JS, Van Loan MD, Keim NL. Size acceptance and intuitive eating improve health for obese, female chronic dieters. J Am Diet Assoc. 2005 Jun;105(6):929-36. Macpherson-Sánchez, Ann E. Integrating Fundamental Concepts of Obesity and Eating Disorders: Implications for the Obesity Epidemic. American Journal of Public Health 105.4 (2015): e71–e85.